Seal it, send it and smile. Flyers, newsletters, brochures and more stay securely fastened in the mail with these mailing seals. 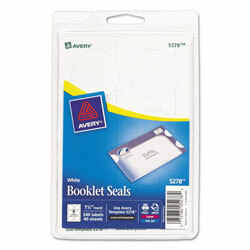 Affix the seals to the edge of the pages, and the permanent adhesive keeps mailings from unfolding while in transit. Customize with free templates available from Avery® Design & Print. Sealing is the smart way to ensure safe mailing, so you can smile without worry. Affix the seals to the edge of the pages to keep mailings from unfolding while in transit. Label Size - text: 1 1/2" dia. ; Label Color(s): White; Machine Compatibility: Inkjet Printers; Laser Printers; Sheet (W x L): 4 x 6. Label Size - text: 1 1/2" dia. White Mailing and Address Labels from Avery! 573 In Stock today.